Here is an interesting and original way to practice yoga surrounded by nature and to the rhythm of water. The concept is simple: find one’s symmetry and balance in order to flowingly go from one posture to another. SUP yoga tones up the body while exercising muscles that are not used during a yoga practice on a mat. All your senses will be stimulated while being completely connected to nature and the here and now. Relaxation guaranteed. We are the first SUP yoga school in Quebec and all our yoga teachers have received a 200 hours minimum yoga training and a SUP yoga teacher training certified by Yoga Alliance and Paddle Canada. Can be taken individually or as a 4 weeks session, SUP yoga is an activity to experience and to adopt. 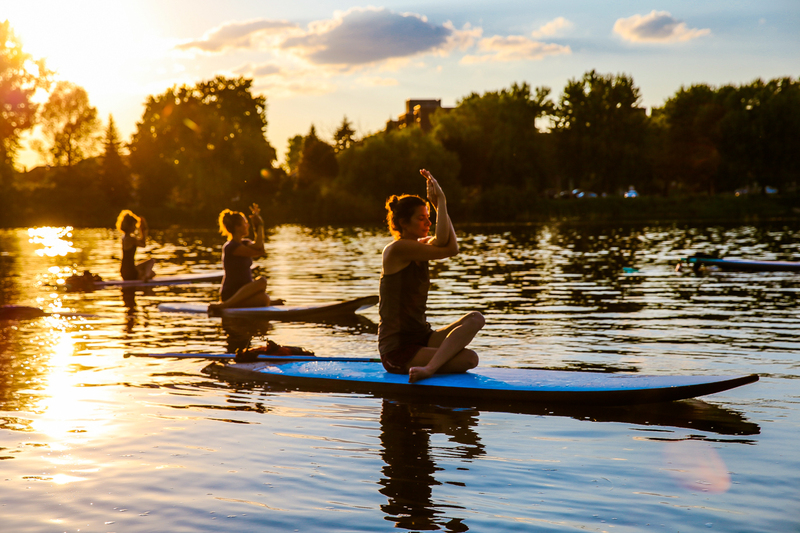 Introduce yourself to the pleasure of SUP and yoga in a playful atmosphere while discovering the most beautiful water areas of Montreal. This course has been developed to give each student the basic skills for both disciplines. You will learn all the important notions in order to paddle properly and you will end the initiation course with a SUP yoga session. The best way to start SUP and yoga. Subscribe to KSF’s newsletter to receive new schedules, promotions and pro tips. Prerequisites: Be confident in water. Participant must be 8 years old minimum; children under 16 must be accompanied by an adult. Prerequisites: Have previously done SUP or taken a SUP or SUP yoga introduction. Be confident in water.Participant must be 8 years old minimum; children under 16 must be accompanied by an adult. 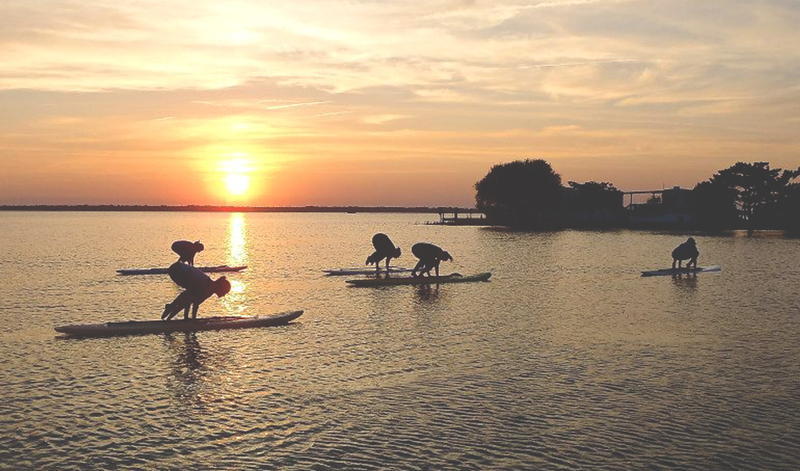 Enjoy the beauty of nature and the energy of the sun to appreciate summer at 6:30 on your SUP board. This early morning outdoor session will start in an exceptional way your day with calmness and serenity. Jala Flo courses are dynamic SUP Yoga sessions intended to suit participants of all levels. The course is similar to one given in a studio, but the poses are adapted to be performed on a SUP board. On the water, stabilizer muscles are put to the test, concentration and the feeling of relaxation are heightened. Different variations are offered so that everyone can benefit from a harmonious and balanced practice. Prerequisites: Have previously done SUP or taken an initiation SUP or SUP yoga course. Be confident in water. Participant must be 8 years old minimum; children under 16 must be accompanied by an adult. The traditional dynamic yoga, or yang yoga, focuses on the flexibility and strengthening of the muscles. In yin yoga, the practice is slower and gentler. The poses are held for longer periods of time, which creates space in the connective tissues, joints, tendons, ligaments, and also in the mind! This season, we offer to combine the benefits of yin yoga with the appeasing element of water during our SUP Yoga sessions. While this practice is desirable for all, you can bet that it will become a must for those who multiply intense physical activities or lead a intense life. Classes evolved from a flow to a slow flow to yin positions in a soft gradation that will relax you on the rhythm of the water.